Last week, there was an incident in Las Vegas involving a hungry overzealous TSA agent who confiscated a freaking cupcake in the name of national security! 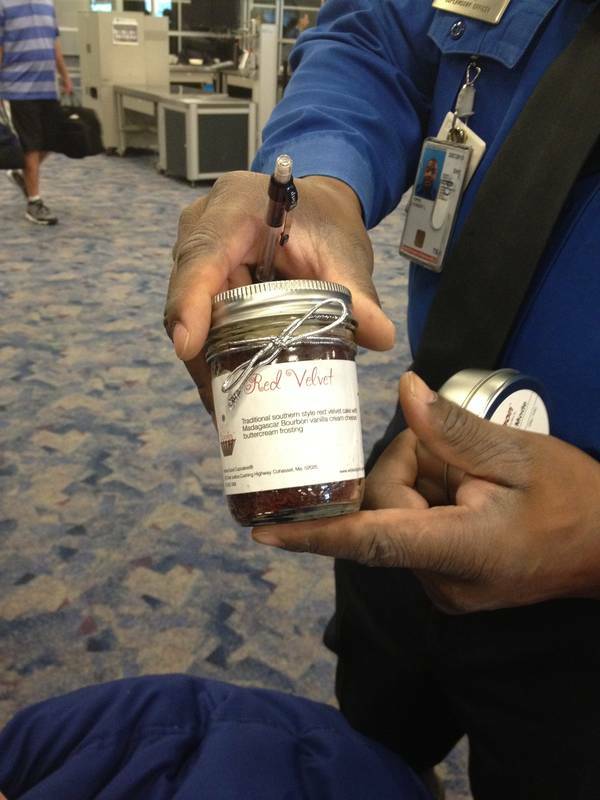 At Las Vegas International Airport, TSA supervisor [REDACTED] is keeping travelers safe from the terror of delicious cupcakes-in-a-jar. I learned this firsthand earlier today, when I put myself and my fellow travelers at risk by attempting to travel with one. The agent who first found my dangerously delectable snack consulted [REDACTED] about it just barely within my earshot. He responded hesitantly at first, saying that he was “not sure”–and “with the holidays coming, it’s getting harder and harder.” When he finally decided my treat was a no-go, I asked to speak with him directly, and he asserted that the frosting on this red velvet cupcake is “gel-like” enough to constitute a liquid, in part because it “conforms to its container.” Also: it “should have been in a zip-lock.” At this, I offered to scoop my dangerously conformist cupcake out of its jar and place it in a zip-lock bag, where it could mush about to its heart’s content; but Agent [REDACTED] wisely refused. After all, the jar in all its tasty glory “clearly contains more than 3 ounces of total contents,” he said. A friend of mine bought a cupcake in Vegas to take home to her mother and TSA x-rayed the cupcake before they allowed her to take it onto the plane. It’s hit or miss with TSA, there’s no consistency. I’m fine with that.. When traveling through Buffalo airport years ago, the TSA guy ran my Arby’s sandwich through the x-ray machine, and he used the wand on my soda. No harm no foul. In defense of the TSA agent, the cupcake does look delicious. A lot of them do not have the background or skills to think on the spot and these stupid situations are the result. Our TSA is mismanaged. If it weren’t, we would not be bombarded with these ridiculous situations. They do not know what they are doing.